Home BUSINESS NEWS Sonko to procure high-capacity buses as Nairobi re-introduces CBD matatu ban in 3 months. Sonko to procure high-capacity buses as Nairobi re-introduces CBD matatu ban in 3 months. Nairobi Governor Mike Sonko during the press briefing on Tuesday morning where he suspended the matatu CBD ban with immediate effect. Nairobi Governor Mike Sonko has with immediate effect, suspended the matatu CBD ban to allow for talks with all affected parties and to alleviate the suffering of wananchi as witnessed on the first day of the implementation of the ban. 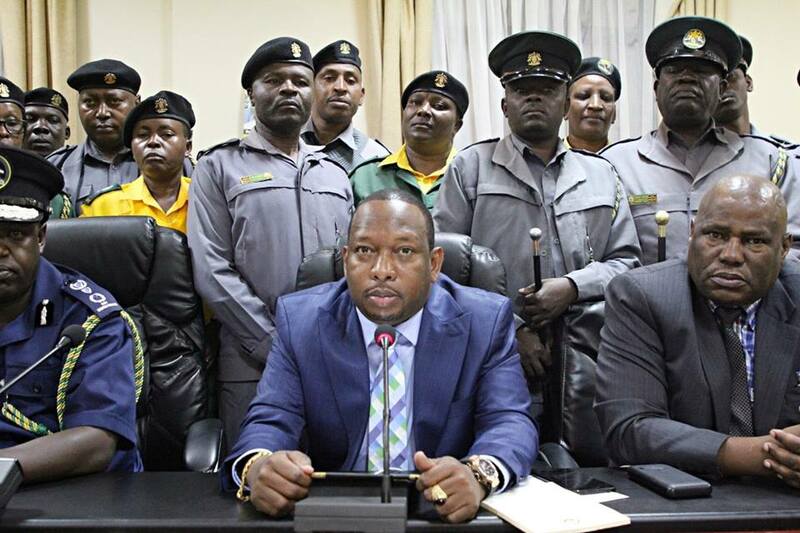 In a press briefing in Nairobi on Tuesday morning, Sonko however said that the retreat was just temporary and will be re-introduced within the next three to four months. “I have noted with deep concern the plight of Nairobi residents as a result of the ban, and hereby announce that the full implementation of this directive has been suspended with immediate effect. This is to facilitate further consultation with all affected parties, in order to find a lasting solution to the problem of vehicular congestion,” said the governor. While speaking in Kiswahili dialect, Sonko said that between now and the next phase of implementation of the PSV ban, his government will lay down a comprehensive strategy to ensure that this time round, it will not negatively affect the common mwananchi. Among the activities that his administration is intending to undertake include expanding the existing bus terminus to ensure they can absorb all PSVs getting into Nairobi, procure several high-capacity buses to be used to ferry commuters from the designated bus termini into the CBD and to complete the six Bus Rapid Transport (BRT) corridors. The Sh9.6 billion Nairobi BRT project got a major boost in October after the European Union (EU) committed a Sh5 billion grant towards its implementation. This money will be used to develop and install BRT supporting infrastructure in three years. About Sh7 billion of the amount will be used to develop five BRT lines and installing the necessary infrastructure while Sh2.6 billion will be used to procure 50 high-capacity buses. Governor Sonko launched scathing attack on those criticising his efforts to decongest the city saying that their ‘noises’ will not intimidate him neither deter him from implementing his agenda as promised to the people of Nairobi. He particularly chided the chair of Matatu Owners Association (MOA) Simon Kimutai whom he described as a cartel who has manipulated the matatu business ever since he (Sonko) was in high school. The governor asked to step aside and let ‘new blood’ take over the leadership of the PSV body. “You (Kimutai) should stop intimidating me or my county askaris. You are the biggest cartel in the matatu industry. You have been in this leadership ever since I was in high school. Just leave and let in new blood who can work with the county government,” said Sonko. He also warned Gatundu South MP Moses Kuria to keep off Nairobi politics, adding that if he (Kuria) had interests in the Nairobi gubernatorial seat, he should wait for his time and to run his government in his own way. “Leave Nairobi alone. You cannot intimidate us with cheap politics of NHIF. If you want to be governor of Nairobi, wait for your time and come plan your government then,” he said to Kuria.